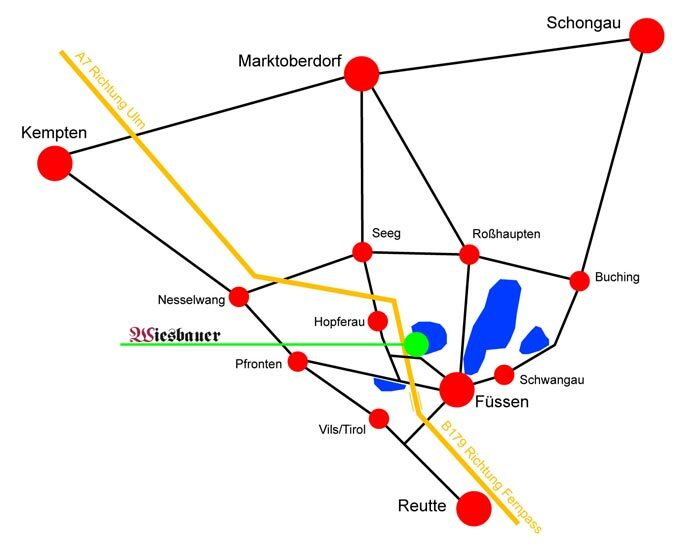 Although we are situated in the natural landscape of the Allgäu you can easily reach our hotel. We would already like to wish you a pleasant journey! 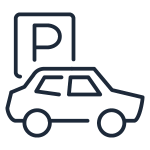 Parking or garage spaces are available for our hotel guests. Day trippers have enough parking possibilities around our hotel. Even the journey with a bus is possible without any problems and you will find enough parking space at the hotel. Leave highway A7 just before the border tunnel at the exit “Füssen”, turn right, after 400m turn right again. Follow the signs “Wiesbauer” – 1.9 km and turn right again. After another 500m you will reach the entrance to the Wiesbauer on the left side. From Austria via the Fernpassstraße B 179. Leave the highway shortly after the border tunnel at the exit “Füssen”, turn right, 700m turn right again. Follow the signs “Wiesbauer” – 1.9 km and turn right again. After another 500m you will reach the entrance to the “Wiesbauer” on the left side. Garage parking space on request.